The pots I make are useful pots: Dishes, things to serve and hold food. But holding food is not what makes them useful. The most important task of a useful pot is to generate caring. Most of modern life does not generate this emotion. Things many of us think of as useful or even essential - cell phones, automobiles, computers, fast food, microwaves - don't generate real caring at all. We could live very well without many of these things. But we can't live good lives at all if we are callous and uncaring. Being indifferent, unconscious, unawake is not something that you can turn on and off at will. We must either find ways of living that encourage awareness or face a loss of sensibility that is likely to seep into all areas of our lives. I don't believe people (at least in modern societies) buy pots because they "need" them in the conventional sense. They certainly don't need them to hold water, or to pour drinks. Any number of things can hold water and probably hold it better than heavy, breakable, expensive pottery. 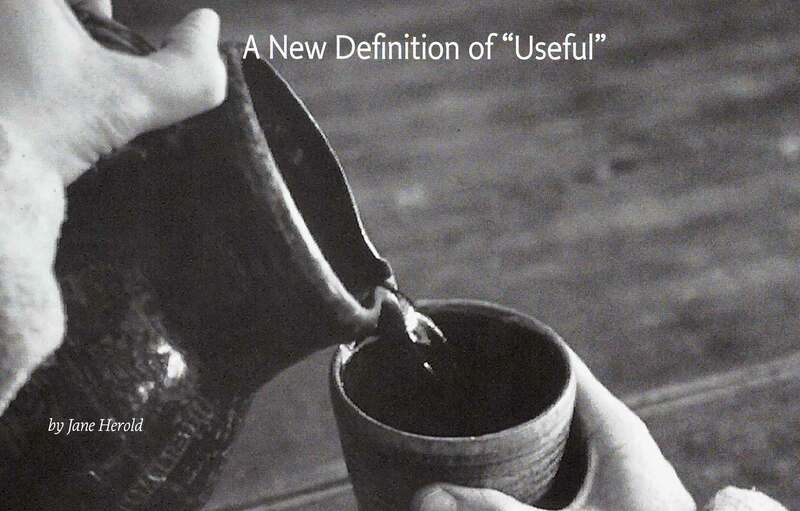 So . . .if it's not about holding water or pouring tea, what does a pot have to do in order to be "useful"? It has to change your level of awareness. A good, useful pot will take you from unconscious to conscious, from mindless to mindful. It will make you aware in ways you otherwise might not be: of color, of form, of texture, of weight, of warmth- of humanness. What's wonderful about dishes, as opposed to "fine" or not-so-useful pots, is that they give us the chance to sense all these qualities right in the midst of everyday life. They don't require a rarefied moment in a museum or gallery, where one tends to respond much more with the intellect than with the body. They engage us on a more sensual level. If you're making pots by hand, this awakening of caring and of feelings is the "use" you've got to talk about. I'd ask two simple questions of any pot, regardless of what it is intended for. "How is it to live with?" and "How would it be to live without it?" 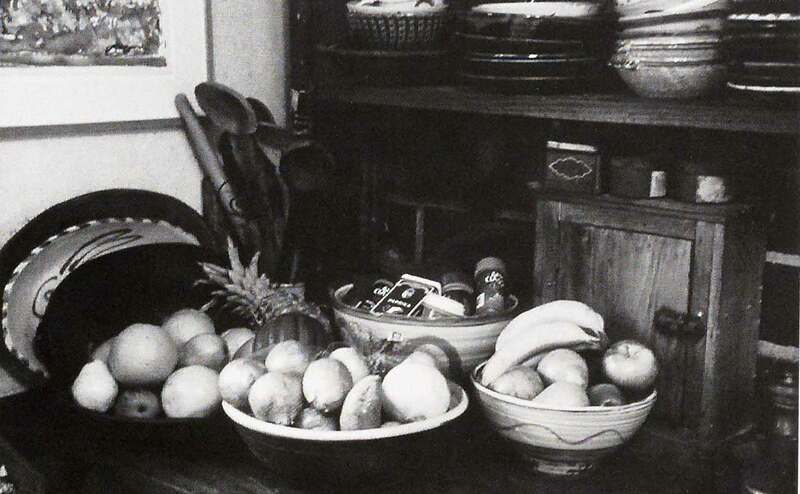 You can ask this about fine art, sculpture, paintings, and you can ask it about the most humble of dishes. People buy useful pots for the same reasons some people buy paintings or sculpture. The difference is that useful pots are generally more affordable, and because they get used and handled daily they offer a much greater intimacy to their users. In addition to shifting our awareness from unconscious to conscious, pots that are dishes will also improve the food! This is no small matter. Dishes make the food look better and therefore taste better. A useful pot will inspire the cook to make a little extra effort when serving up dinner. A good dish will make you bother with a sprig of parsley or a wedge of lemon. It will garner volunteers for washing the dishes! People feel receptive around food. They can smell it and are ready to taste it. It's not so hard to wake up their eyes, their sense of form, an almost physical reaction to shapes. They're ready to perceive, and it's into this little open perceptive space that a simple dish can slip, touching someone intimately in an unguarded moment. For dishes, every meal is an opportunity. Dishes can sidle up to you the way a dog sits at your feet while you're eating; you start petting his head without really thinking about it, but something good comes through. You find you feel a little warmer, a little softer or kinder, a little more in sympathy with the world. A good mug can reach past your intellect to your feeling self in the same way. It can get your attention, and then keep you interested. It talks to you. It gives you its company. It has a presence, and its absence would be a real loss. Good pottery is "useful" in the sense that it's good to live with. It actually makes your life better. And dishes often do this "waking up" much better that "fine" art. The amazing thing about useful pots is that they exert this humanizing influence and awaken these feelings of caring without any fanfare or particular effort. I read a poem by Geraldine Zetzel in which a woman, talking about getting older, says she's dropped and broken a bowl while visiting her son. She says, "From now on, I'll carry plates as if they were newborn babies." What a wonderful image! That kind of awareness is something we could all use more of in our lives. Potters, by making dishes that get used every day, can give that gift. To be worthy of the term "useful," the very least we ought to expect of a pot is that it meet the basic criteria of being "good to live with." Like a good dog, it should not jump up all over you or yap and bark, demanding your attention. It should make you feel welcome, with that sense of having come home that you get from a familiar smell or land scape. Domestic pottery is like a landscape, giving a home an ambiance, punctuating and defining the spaces we live in. They affect relations between people, raising little questions like, "Which cup would you prefer7" If they're useful pots they occupy space in a meaningful way, balancing the weights around the table, contributing their own presence to the mix. For those who curate shows, choose pots to show students, or invite people to workshops, you might consider asking some slightly different questions about useful pottery. Instead of asking "Is this pot exciting?" or "Is it challenging?" or - worst and silliest of all, given the ancient history of pot-making" Is it original?" you might try asking, "How badly would I miss this pot if it were gone?"